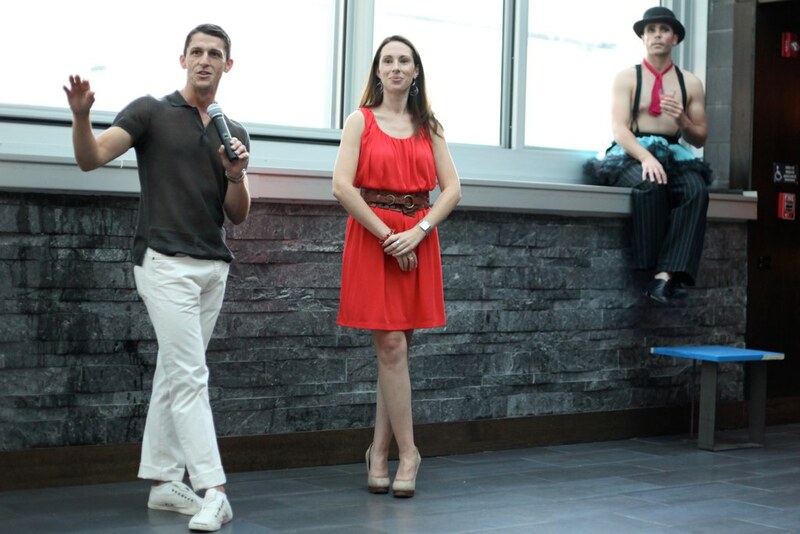 Jay Franke and Evin Eubanks address the crowd while Chicago Cabaret Project's Kyle Hustedt looks on. Photo by Vin Reed. Last night the Chicago Dancing Festival (CDF) kicked off its summer season with a launch party 5 After 5 at Benchmark in Old Town. Dance enthusiasts, supporters, board member, artistic staff, bloggers, pr reps and dancers all gathered on the top floor of the swanky bar to mingle and toast the start of CDF events. Executive Director Evin Nicole Eubanks greeted guests at the door, while Co-Founder Jay Franke worked the crowd. Notable absent was Co-Founder Lar Lubovitch who is out of town with his company that is performing at Jacob’s Pillow through July 24th. Kristi Burris and Jessica Chapuis show us how it's done! Photo by Vin Reed. After sipping cocktails — Bean and Body even crafted a signature Cinq cocktail for the event – emcee Kyle Hustedt from the Chicago Cabaret Project opened with a rousing and humorous rendition of Wilkommen from what else…Cabaret! After “wilkommening” the crowd, Hustedt introduced the first of three dance performances of the evening. Chicago Human Rhythm Project‘s Kristi Burris and Jessica Chapuis delivered (I really want to say good, old-fashioned) tap-off with each taking syncopated turns on their wooden stages. Fun! Amber Jackson and Louis Jackson perform at CDF's "5 After 5". Photo by Vin Reed. After a short pause, DanceWorks Chicago dancers Amber Jackson and Louis James Jackson (no, they aren’t related) literally exploded out of the crowd with a sassy piece “Beat in the Box” choreographed by Brian Eno. I found out later that this was the last performance with DWC for these two beautiful dancers. Louis is heading out as a performer on a cruise ship and Amber is looking for a job as a school teacher. Best of luck to both! Moníca Cervantes and Eduardo Zuñiga of Luna Negra getting close. Photo by Vin Reed. Luna Negra dancers Moníca Cervantes and Eduardo Zuñiga later wowed the crowd with a flirty duet created by Artistic Director Gustavo Ramírez Sansano for the event. After the performances, more mingling ensued. I got to meet some of my fellow CDF bloggers (click the icon at the top right of this page for more info) in the festival blogger intiative: Scott Silberstein, Miguel Cano, Araceli Arroyo as well as Astek Consulting rep Rachel Yeomans and catch up with Silverman Group gurus Beth Silverman and Eric Eatherly. I especially enjoyed hanging with visual artists Sasha Fornari and Vin Reed. It was a fun evening and great way to start the CDF festivities! This entry was posted in Chicago Dancing Festival 2011, Chicago Human Rhythm Project, DanceWorks Chicago, Jay Franke, Lar Lubovitch, Luna Negra by Vicki. Bookmark the permalink. Great to hang out with you too! awesome write-up for a fun event 🙂 CDF is going to rock this year. great wrap-up rogue – looking forward to more festival hanging.